Sheikh Al-Sheibi receiving the new kiswa for the year 1430 A.H. (2009). Sheikh Abdul-Aziz Al-Sheibi, keeper of the Holy Ka'aba's door key, passed away at 3.am Sunday morning, 7 November 2010/2 Dhul-Hijja 1431 Hijri, following a heart attack. He suffered illness and pain in the chest and was taken to Jeddah international hospital. He had been ill, and used a wheelchair, for many years. He was 82. He was buried at Mua'la Cemetery in the sacred enclosure next to Sayyida Khadija, Prophet Muhammad's wife, after funeral prayers at the Grand Mosque in Makkah. The Bani Shaiba is an Islamic tribe that hold the key to the Ka'aba. Prophet Muhammad (May Peace and Blessings be upon him) handed the key to Bani Shaiba in the year of the conquest of Makkah, and said, "Take it, O Bani Talha, eternally up to the Day of Resurrection, and it will not be taken from you unless by an unjust, oppressive tyrant." The family has held the key for the past 15 centuries. The King of Saudi Arabia has to seek the permission from the senior member of the Al-Sheibi family before he can enter the Ka'aba. King Abdullah bin Abdul-Aziz telephoned the family and the sons of Sheikh Abdul Aziz bin Abdullah Al-Sheibi to offer his condolences and sympathy to the Al-Sheibi family. Al-Sheibi passed away a few hours before he was to officially transfer the new kiswa or black cover to the Ka'aba at the beginning of the Hajj month this year. The total cost of the cloth over the Ka'aba was more than 20 million riyals (£3.3 mn, USD5.3mn). The cover is 658 sq. metres long, and is made of 670 kilograms of pure silk. For embroidery, 15 kg of gold thread was used. It consists of 47 pieces of cloth, and each piece is 14 metres long and 101 cm broad. The black cover (kiswa), replaced anew annually, is draped on the Ka'aba and fixed to the ground with copper rings. The 70 cm, gold-and-platinum Ka'aba key is painted in Islamic green with a glazed gold head. Verses from Qur'an are engraved on either side. The key leaves its locked cabinet twice a year, when the Saudi king opens the Ka'aba's door for cleaning of the interior and change of its black cover, as well as when he takes Muslim heads of states on a visit to the Ka'aba. 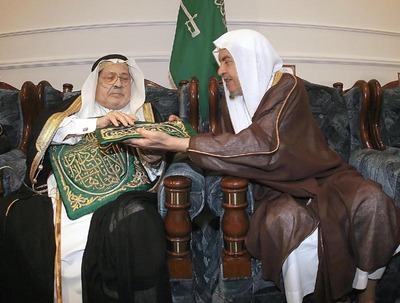 Al-Sheibi had kept the key for the past 18 years, before his retirement; he held the position of Director General of Religious Affairs and Mosques in Makkah at the Ministry of Hajj. He has four sons: Talal, Hashem, Marwan and Nizar. The brother of the deceased, Abdul Qader Al-Sheibi, who is now the key-bearer of the Ka'aba, said his brother's death was painful for him, and "the pain gets harder when I open the Ka'aba's door and memories come to me, but it is Allah's will." A number of Makkah's residents expressed their sorrow at losing Al-Sheibi. Among the comments made was that Mecca has lost a "good son" and a "pious sheikh" and "our hearts are full of pain and our souls sad". Sheikh Abdul-Aziz Al-Sheibi was a very dear friend who I had known for the past many years. He was a regular attendee at the Mawlids in Makkah held by the Sayyids of the Ba'Alawi family. He once said to me "I hold the key to the holy Ka'aba; what better honour can a Muslim crave in this world." He was the last of his generation and a very modest and humble servant of the Ka'aba. He lived a simple life at his small house. I was presented with a family tree going back to Usman Bin Talha, who was given the key by the Prophet, and a signed book by Al-Sheibi. As the years go by I will definitely miss him.